Sylvester James Gates, Jr.'s postgraduate studies began with his appointment as a Junior Fellow of the Harvard University Society of Fellows (1977-1980) and continued with an appointment at California Institute of Technology (1980-1982). He has been a faculty member at M.I.T. (1982-1984) and the University of Maryland at College Park (1984-present). From 1991-1993, Professor Gates took leave of absence from the University of Maryland to serve as Physics Professor and Departmental Chair at Howard University. Because Prof. Gates has authored or co-authored over 120 research papers published in scientific journals, co-authored one book and contributed numerous articles in others, he travels widely speaking at national and international scientific meetings. 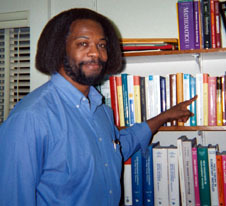 His research, in the areas of the mathematical and theoretical physics of supersymmetric particles, fields and strings, covers topics such as the physics of quarks, leptons, gravity, super and heterotic strings and unified field theories of the type first envisioned by A. Einstein - read Taking the Particle out of Particle Physics by Gates and Siegel at http://insti.physics.sunysb.edu/~siegel/quo.html. You can hear Dr. Gates speak at http://www.nsf.gov/od/lpa/lecture/stringtheory.htm or a real audio recording of his Australian lecture, Why Einstein Would Love Spagehtti in Fundamental Physics or Finishing off what Einstein started, at http://www.abc.net.au/wa/stories/m651864.ram. Dr. Sylvester Gates' study of the mathematical laws that govern hypothetical forms of energy and matter have paved the way for 21st century exploration of the universe at tiny scales never before previously accessible. He has published over one hundred research papers, co-authored one book and contributed numerous articles in others. His research is in the areas of the mathematical and theoretical physics of supersymmetric particles, fields and strings, and covers topics such as quarks, leptons. gravity superstrings and Einstein's unified field type theories. He coauthored a book, Superspace, that provided the only advanced treatment of supersymmetry for more than a decade. In the 1980s, Dr. Gates worked on structures called "superstrings" and "heterotic-strings" and showed how a 1930s physics concept called "isotopic charge space" applied in four dimensions. In 1996, he formulated a model by introducing the superpartners "pionin" for the nuclear force. Professor Gates shares the N.T.A. 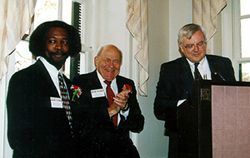 's 1993 Technical Achiever of the Year Award with astronaut Dr. Bernard Harris and also received the recipient of the N.T.A. 's 1993 Physicist of the Year Award. Professor Gates was chosen to be the first recipient of the American Physical Society (APS) Bouchet Award and became a Fellow of the APS in 1994. Sylvester James Gates was inaugurated as the first John S. Toll Professor in Physics. 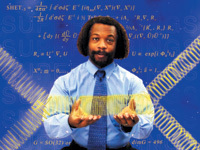 He is currently serving as the president of the National Society of Black Physicists (NSBP). from Georgetown University 2001 Citation Recognizing Sylvester James Gates, Jr.
"Professor Sylvester James Gates, Jr. has played a leading role in exploring the most fundamental frontier of theoretical physics, the unification of Einstein's General Theory of Relativity with the theory of relativistic quantum mechanics. Together with colleagues from around the world, Professor Gates has shown that it is possible to construct a theory that can describe the entire natural world, from the tiniest particles inside the nuclei of atoms to the cosmic dance of galaxies, with a single unifying principle, based on the strange- sounding ideas of string theory and supersymmetry. Professor Gates received his Ph.D. from M.I.T. in 1977 for studies of elementary particle physics and quantum field theory. He continued his research as a Junior Fellow of the Harvard Society of Fellows and ended at the California Institute of Technology. His first faculty appointment was at MIT. He then joined the Physics Department at University of Maryland at College Park, where he is now the first John S. Toll Professor of Physics. He is the first African-American to hold an endowed chair in physics at a major research university in the U.S. Professor Gates has authored or coauthored over 120 research papers published in scientific journals, co-authored one book and contributed numerous articles in others. Professor Gates has won many awards, including the Edward A. Bouchet Award from the American Physical Society. The Washington Academy of Sciences named him as its 1999 College Science Teacher of the Year. In addition to his research accomplishments, Professor Gates is known for his skill at communicating the ideas at the frontier of particle physics to a general audience. He has also spoken and written eloquently on issues of general education in science and mathematics, challenge of technical education for African-Americans and the issues of affirmative action, diversity and equity. For your contributions to advancing the frontiers of human understanding of nature, your skill and dedication at communicating those advances to scientific and non-scientificaudiences, and your role in promoting diversity in science research and education, Georgetown University is proud to confer upon you, Sylvester James Gates, Jr., the degree of Doctor of Humane Letters, honoris causa." The following comes from program to be aired on PBS' NOVA during October 2003. S.James Gates, Jr., V.G.J. Rodgers, SUPERGRAVITONS INTERACTING WITH THE SUPERVIRASORO GROUP. Phys.Lett.B512:189-196,2001. S.James Gates, Jr., B. Radak, V.G.J. Rodgers, IRREDUCIBLE DECOMPOSITION OF PRODUCTS OF 10-D CHIRAL SIGMA MATRICES. Comput.Phys.Commun.136:173-181,2001. C. Curto, S.James Gates, Jr., V.G.J. Rodgers, SUPERSPACE GEOMETRICAL REALIZATION OF THE N EXTENDED SUPER VIRASORO ALGEBRA AND ITS DUAL. Phys.Lett.B480:337-347,2000. S.James Gates, Jr., V.G.J. Rodgers, TYPE B / TYPE O BOSONIC STRING SIGMA MODELS. Phys.Lett.B405:71-78,1997. S.James Gates, Jr., V.G.J. Rodgers, A TRULY CRAZY IDEA ABOUT TYPE IIB SUPERGRAVITY AND HETEROTIC SIGMA MODELS. Phys.Lett.B357:552-557,1995.